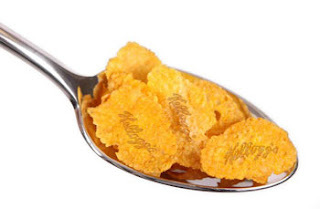 Kellogg’s will laser-brand its cornflakes – one flake at a time – ¿¡ tjongolongo ?! Kellogg’s takes micro branding to the next level. According to the Kellogg’s UK press office,. Kelloggs has developed a high-tech method to stamp out imitation cereals – by branding Corn Flakes with the company logo. They are actually planning to brand its logo on individual flakes using lasers. They plan to produce some trial batches first to test the system. However, if all goes well, they are considering to add a portion of branded flakes into each box to ensure the cereal’s origins and protect against any imitation cereals. Crunchy Nut and Bran Flakes. When the news started to come out websites immediately popped up wondering if this wasn’t a hoax. However, soon after Kellogg’s UK released an official press release claiming that it isn’t a hoax. Tjongolongo, I think this is an amazing way of branding your product. If Kellogg’s can pull this off, I can imagine they can use it for more than just guaranteeing the origins of the flakes. They can pull a Willy Wonka and perhaps brand only a few flakes with a special sign that can win you a price if you manage to salvage it in one piece! Can you imagine going through a box of flakes trying to find THE flake. I’m sure we’ll be surprised how many people will actually take the time to do that! Jeremy – If they figure out a way to laser-brand Rice Crispies, I'll be really impressed! Kijk ook maar even naar dit filmpje: Shreddies was een beetje een sleets merk in Canada. Vierkante volkoren wafeltje bij wijze van ontbijtgranen, mmm, de klad zat er een beetje in.